There's an eccentric English chap called Christopher Monckton of Brenchley who has Anthony Watts of WUWT in thrall. Barry Bickmore can fill you in on this vexatious Viscount. Monckton is claiming that there 'hasn't been any significant warming for seventeen years and four months'. That's right. I kid you not! He has done his sums and it's seventeen years and four months. Oh and I guess its seventeen years, four months, one day, 13 hours and 25 seconds by now. It's good to know that he's finally settled on a number. His previous lucky dips were for 16, 17, 18, 19 and 23 years (all in the one letter); then he went for "approaching two decades"; then just last month it was 18 years. Apparently Monckton is trying to put one over the 8% Dismissives over at WUWT, an anti-science blog. I don't know why he bothers. The clowns over there already have their heads stuffed full of insects, underwater volcanoes, exploding vegetation, ice ages peeping around corners, lack of ENSOs, leaping El Ninos and scientific dogs. I doubt there is room in their heads for another denier meme. Still, I suppose Anthony has to fill up that white space with nonsense several times a day to keep his crowd entertained. The way I see it, Anthony Watts had a whole heap more than usual of Friday Funnies on WUWT this week. This article by Monckton was just one of many. Anthony chose to make Monckton's article a "sticky". When you're down on your luck you take what you can get. And Anthony hasn't been having much luck at all lately. The basis of Monckton's article was ostensibly Santer et al (2011), so I thought I'd write some of what that research found. The Santer paper is titled: Separating signal and noise in atmospheric temperature changes: The importance of timescale. ...Because of the pronounced effect of interannual noise on decadal trends, a multi-model ensemble of anthropogenically-forced simulations displays many 10-year periods with little warming. A single decade of observational TLT data (temperature of the lower troposphere) is therefore inadequate for identifying a slowly evolving anthropogenic warming signal. Our results show that temperature records of at least 17 years in length are required for identifying human effects on global-mean tropospheric temperature. ... In summary, because of the effects of natural internal climate variability, we do not expect each year to be inexorably warmer than the preceding year, or each decade to be warmer than the last decade, even in the presence of strong anthropogenic forcing of the climate system. The clear message from our signal-to-noise analysis is that multi-decadal records are required for identifying human effects on tropospheric temperature. Minimal warming over a single decade does not disprove the existence of a slowly-evolving anthropogenic warming signal. it's important to not introduce noise unnecessarily. ...The clear message from our signal-to-noise analysis is that multi-decadal records are required for identifying human effects on tropospheric temperature. Minimal warming over a single decade does not disprove the existence of a slowly-evolving anthropogenic warming signal. However, as Anthony explained yesterday, the stasis goes back farther than that. He says we shall soon be approaching Dr. Ben Santer’s 17-year test: if there is no warming for 17 years, the models are wrong. In order to separate human-caused global warming from the "noise" of purely natural climate fluctuations, temperature records must be at least 17 years long, according to climate scientists. Look we're used to Monckton making up stuff. We don't have to just lay down and take it though. Let's move along. What else did he do wrong? For one thing, he plotted temperature by month, not annually. What he hoped to achieve I don't know. Nor do I know if his "results" would have been any different. But what I do know is that a monthly plot exaggerates the noise and hides the multi-decadal signal. Why do you think Spencer always provides monthly plots? It's so that every so often he can gig up the crowd by claiming a drop in temperature. Yes, from the previous month! Even though it's well above the temperatures of the eighties and nineties. As if you couldn't tell anyway. He's presenting the chart as a monthly chart, stuck some lines on it that he claims are IPCC "backcasted projections", added some dodgy numbers in the left hand corner and put a reference to an IPCC AR5 figure, when AR5 hasn't even been released yet. I suppose he was right about one thing. Any "cooling" he might have been able to fiddle is not going to be statistically significant. On the other matters, since the IPCC's "forthcoming" Fifth Assessment Report is still "forthcoming", neither Monckton nor I would be in a position to say whether it will include any charts that hindcast or backcast or project. He may have access to the previous draft, but that's a long way from a final version. What is obvious is that Monckton hasn't the slightest clue about models or climate. I mean in his second chart as shown above, he's looking at only eight years for heavens sake. Eight years isn't multi-decadal. Does he expect surface temperature to go in a straight line somewhere? Let's do multi-decadal using the same temperature series, HadCRUT4. It doesn't look anything like what Monckton drew. You can check for yourself here. I've marked both 1995 (seventeen years of data) and 1996 (sixteen years of data) for what it's worth. But you don't have to stop at 1995 or 1996. You can see the trend goes back a lot further than that. The world is getting hotter. I didn't see anyone ask Monckton to explain all the other signs that the earth is warming, but there were a lot of comments so I might have missed it. James Hansen, Makiko Satoa and Reto Ruedy: 2012: Perception of climate change. Proc. Natl. Acad. Sci., 109, 14726-14727, E2415-E2423, doi:10.1073/pnas.1205276109. Nick Stokes at Moyhu has some pretty charts as well as some interactive charts for you to play with. and more in the scientific literature. June 13, 2013 at 7:20 am ...Note the implicit swindle in this graph — by forming a mean and standard deviation over model projections and then using the mean as a “most likely” projection and the variance as representative of the range of the error, one is treating the differences between the models as if they are uncorrelated random variates causing >deviation around a true mean!. Monckton didn't seem to object to being called a swindler and we'll see why shortly. Nick popped in quite some time later and recognised rgbatduke had made an erroneous assumption. Nick figured out that rgbatduke had the wrong end of the stick and thought the graph was one of the IPCC's. rgbatduke is obviously not au fait with IPCC reports or he would have twigged at once that the charts were inventions of the potty peer himself. It's a madhouse at WUWT. As a reward for reading through to the end, here's a little bit of CO2 for your exploding plants. "Abstract. We compare global-scale changes in satellite estimates of the temperature of the lower troposphere (TLT) with model simulations of forced and unforced TLT changes. While previous work has focused on a single period of record, we select analysis timescales ranging from 10 to 32 years, and then compare all possible observed TLT trends on each timescale with corresponding multi-model distributions of forced and unforced trends. We use observed estimates of the signal component of TLT changes and model estimates of climate noise to calculate timescale-dependent signal-to-noise ratios (S/N). These ratios are small (less than 1) on the 10-year timescale, increasing to more than 3.9 for 32-year trends. This large change in S/N is primarily due to a decrease in the amplitude of internally generated variability with increasing trend length. Because of the pronounced effect of interannual noise on decadal trends, a multi-model ensemble of anthropogenically-forced simulations displays many 10-year periods with little warming. A single decade of observational TLT data is therefore inadequate for identifying a slowly evolving anthropogenic warming signal. Our results show that temperature records of at least 17 years in length are required for identifying human effects on global-mean tropospheric temperature." Is your name Christopher Monckton by any chance? "...temperature records of at least 17 years in length are required for identifying human effects on global-mean tropospheric temperature"
Assuming a normal distribution of variation around the trend to be identified, you achieve a chance (not a certainty) of identifying a trend above normal variations at 17 years (for the tropospheric satellite data). If, however, you cherry-pick an extrema, such as the 1998 El Nino, you've thrown away much of that normal distribution. Having started from that extrema, more data will be required to positively separate a trend from the null hypothesis of "no warming". • Over no period is warming statistically excluded. • Over no period is the hypothesis of "no warming" statistically supported WRT a null hypothesis of the longer term trends. • And over any period with enough data to actually separate the two hypotheses – there is warming. It is incumbent upon those making a claim to support it. 17 years of flat line does not support the man-made theory. When will people get how science works, your theory you support it, it is not for those who do not see the evidence to support not seeing the evidence. Simple really, shame the internet allows people to say such daft things. I can recommend a good optometrist if you live locally. Or perhaps a science or maths tutor? According to the rigors of scientific discipline,no theory or hypothesis is worthy of any consideration unless it implies the sort of evidence that would prove it wrong.Predictions based on the theory are tested against the facts.how many anomalous results are necessary to invalidate a proposition?to paraphrase Einstein.... a mere one.Such a one is the 17-year global warming hiatus.Ergo the AGW theory has been discredited.End of story.Game over.The alarmists lose. 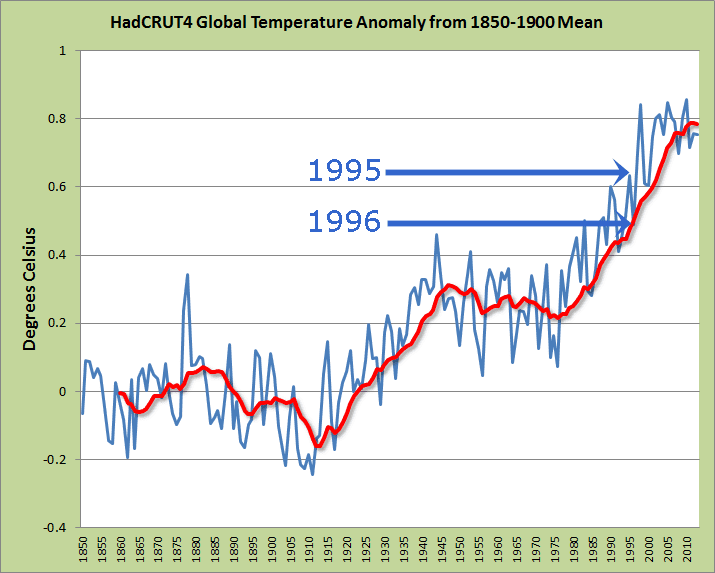 There is no global warming hiatus. So Anonymous agrees that Einstein's theory of relativity is wrong. It must be, as it doesn't predict anything nearly accurate when we go to the subatomic level. Not just "a mere one" anomalous result! And thus, per "anonymous", Einstein's theory of relativity is discredited and we shouldn't send any satellites into space anymore, because the theory that has helped us predict their path has been discredited.